Let’s say that you are working for a multinational company that has headquarters all over the world. You are working on the Asian division, offices located in Japan. But the company has decided to transfer you to Spain in order to start working for a while at the Barcelona offices. What would be the legal procedure there? Should you apply for a regular work permit? The answer is simple: no. In that case, the intra-corporate transfer visa will be your legal way to proceed. In this post, we are going to learn about all the relevant issue of this residence authorization. Are you ready? WHAT IS THE INTRA-CORPORATE TRANSFER VISA IN SPAIN? 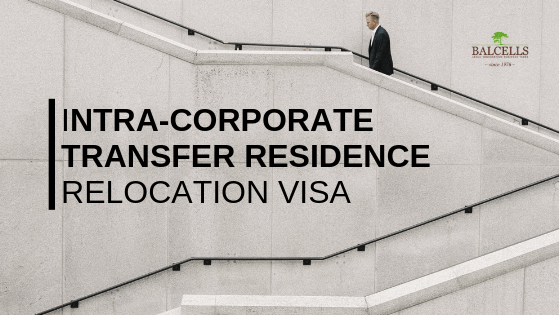 The intra-corporate transfer visa is a residence visa for foreign workers (non-EU) that are being transferred to offer their services for a company or corporation established in Spain. This permit allows them to live and work legally in the country for a whole year (plus renewals). Mainly, this special type of residence permit regulated by the Spanish Entrepreneur Law is for individuals who will be doing their training in Spain, for managers who will be directing a team, or for workers who will be offering their services in the Spanish headquarters of the company or group. We have already seen other types of visas for individuals with a job offer as a highly qualified professional in Spain. In that case, if you had a job offer in a skilled or managerial position and you possessed a master or Ph.D., you could get your residence authorization. But the intra-corporate transfer visa is different. In this last case, we are talking about individuals who do already possess a job position in the same company they will be working, but now in Spain. They will just change the country from which they work. And that carries a peculiarity with it. The worker will not be the one registering in Spain. He or she will keep the contract with the company in the origin country, as before. It will be the company the one in charge to transfer the salary, pay the social security quotations and keep the legal obligations with the worker. Take into account that transfers between companies part of the same group also apply here and is completely valid. Under this path companies can transfer managers for a certain period of time, specialists or trainee employees to embark their training in Spain. Provided that they notify it, workers who possess this residence authorization can also work and live in one or several other EU countries. 3 years in the case of managers. After the first one-year residence authorization, they can apply for a 2-year renewal if the initial conditions and requirements are still met. 1 year in the case of workers realizing their training in the country. Under this category, we find the type of workers not included in the before mentioned case. We are talking about the transfer of workers to execute and manage a working relationship; or in those cases in which the maximum length of the ICT-EU has ended. In this case, the visa is concretely named national residence permit for the intra-corporate transferee. HOW AND WHO SHOULD APPLY FOR THE TRANSFER VISA? There is something crucial we should bear in mind when transferring workers to Spain from another country. How to apply for this kind of permit? It won’t be the worker itself who initiates the application process, but the company or conglomerate. The multinational will be the one starting the application process for the residence permit when the worker is still not in Spain. Where? To the Unit for Large Companies and Strategic Sectors, the institution that manages permits and procedures related to companies, entrepreneurs and highly qualified permits. In regards to the renewal, it must be applied for within 90 days after the expiration of the permit (with no delays); or 60 days prior that same date. It can be done by the worker or by a representative. -The average size of the staff team of the company must be higher than 250 in Spain. And that must be true for the three months prior to the application. -The annual net turnover of operations in Spain must be higher than 50 million euros. -Net worth in Spain must be over 43 million euros. -Foreign annual average gross investment can’t be under 1 million euros during the three years prior to the transfer application. -Stock value in Spain higher than 3M according to the Registry of Foreign Investments of the Ministry of Industry, Commerce and Tourism. -Small and medium-sized companies operating in strategic sectors. That is, those companies that contribute to the socio-economic development of the country. Even though every residence permit has its own upsides, this particular visa has plenty of incentives for non-EU citizens. Which are the exact benefits of the intra-transfer visa in Spain? First of all, the easiness of the application process. The worker who will be transferred into the Spanish headquarters can reside legally in the country during the application process, without the need to hold an actual residence permit. This makes all the steps much simpler. Why? Because the worker can be in Spain to work on the required bureaucracy with the company without the need to worry about time spent or about her legal condition. –Streamlined processing. The processing for the transfer visa has a preferential status, both on the consulate located in the country of origin and in the Immigration Office in Spain. This translates into fast application processing. It just takes 10 days for the visa, and 20 for the residence authorization to be conceded. -There is no need to do any labor market test, something that is required by other types of related permits. -Once you get the residence authorization as a transferred worker, you can enjoy free movement through all the Schengen states. -You can also bring your family to Spain with you. Once you do your application, your direct relatives (spouse or unmarried couple, parents in your charge, and children), can also include theirs. This simply means that they can also work and live legally in any part of the national territory. How does it work? Your spouse and children must apply as if they were family members of an investor, including the same documents required in that case. Something which is crucial in the application of any kind of residence permit in Spain is to meet all the necessary requirements and to submit the required documents. There are some general requirements that are common to all visas (we will fastly review them), and also others specific to the intra-transfer residence authorization for workers. -During the application process, the worker who will be relocated does not have the need to be in Spain (as it is the company who initiates the procedure). But, if the individual will be in the country, being on an illegal status is not permitted for a successful application. -The applicant (worker) must be over 18 years old. -You will need to submit your background check; therefore having clear criminal records is fundamental. -You will need to have private or public health insurance with full coverage in Spain. -Proving that you have sufficient funds is also necessary. -Submitting the application form for the national visa, which you can find here. -You should also pay the corresponding processing fee. Finally, the part which you should take a closer look at. We will now go over the main requirements and conditions you will need to fulfill in order to be eligible for the Spanish intra-corporate transfer visa specifically. -As we have already mentioned, the company that transfers you to Spain will initiate the procedure. Once they do the application with the Unit for Large Companies and Strategic Economic Sectors, they will receive the “authorization of residence of intra-corporate transfer” from the Dirección General de Migraciones. You will need that document, approved, in order to do your own application. -Showing some evidence that the activity of the company you will be working in Spain actually exists. That must be done through an accreditation of the business activity. -You should also accredit that you have had a professional relationship with the company during the last 3 months prior to the application. -Furthermore, the relocated or transferred worker must have a minimum of 3 years of experience; or possess a graduate degree. -Finally, a document that certifies the confirmation of the relocation from the multinational company. That is, proof that the company really desires to transfer you into Spain. *You should bear in mind that all the documents submitted for the application must be legalized and certified by the Apostille of the Hague, and legally translated into Spanish. DO YOU HAVE ANY DOUBT REGARDING THIS WORK PERMIT? Even though this type of work visa for qualified workers and managers enjoys streamlined processing, the procedure can be a bit tedious if you do not exactly know the steps to follow and how to quickly navigate through them. That is why we would like to help you. At Balcells Group we have helped over 1000 clients worldwide get their residence permit in Spain. And, for sure, we have helped many companies with their worker’s relocations. That is why we can guide you with everything you should know. Then, if you would like to have a group of immigration lawyers helping you throughout the whole process, preparing all the required documentation and submitting it for you; do not hesitate to contact us, we will be glad to help! ASK US ANYTHING ABOUT THE INTRA-CORPORATE TRANSFER HERE!